It’s So Much More Than Just The Thighs. I’ve thought to myself many times, will my son ever forgive me for some of the pictures I post of him, publicly, on the Internet? Will he care that his most beautiful, most precious baby thighs are slapped here, amongst a few late-night words, not ONLY for the sake of a post, but for the bulk of a post, at least? There’s really so much more to it than that. I’ve often wondered to myself, should I be blogging so much about my son’s life, should I be plastering his photos for all the world to see? I’ve thought about it so much, and really, that is a post for another day. I’m curious about other mama’s bloggers perspectives on this, and if they have certain personal ‘rules’ they abide by. I mean, obviously there’s some things I just wouldn’t blog about. But I have blogged about our take on circumcision, for example, and our choices and decisions around that. Will he care, when he’s 10 and essentially everybody knows about his most precious boy parts? The ethics of it all. Not even just that, the morality, humanity aspect of it too. I obviously would never seek to exploit or harm my child, or to damage him, emotionally, mentally, spiritually, physically. I want nothing but the best for my baby. By exercising my creativity and my quest for inner peace and spirituality, am I harming my son’s sense of self in the process? It’s really up for debate, and I don’t think there is a right answer. I do think there are lines that need to and should be drawn, and I think as he gets older, we will figure out exactly where and how those lines need to be drawn indeed. 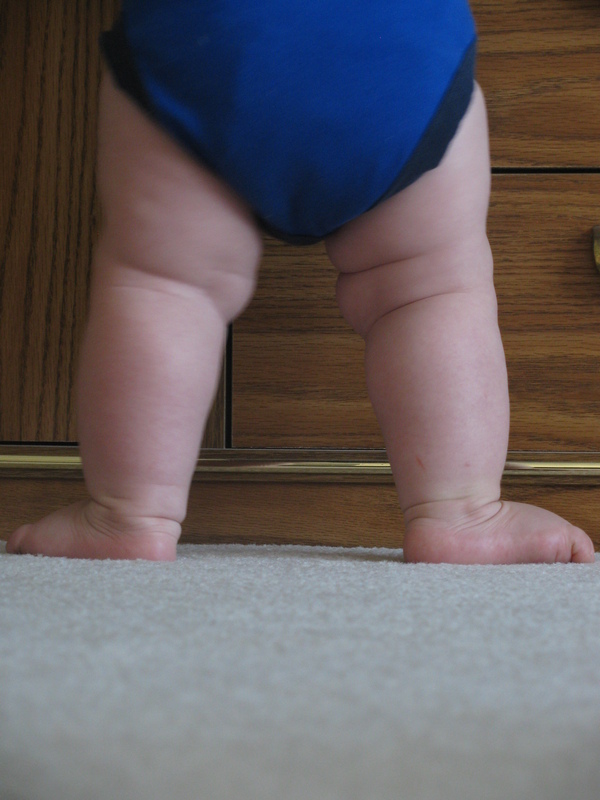 But for now, this face-less photo of the cutest baby thighs I ever did see. It’s late, and I am partially posting just to post, but mostly, I am posting because this is something that I’ve thought about incessantly and I don’t want to forget about it. Happy Friday, Happy Weekend, and Happy Baby! xo! Entry filed under: Cade, Mamabear. Tags: children, creativity, mommy blog, motherhood, parenting, parenting blog, privacy, saskatoon, sense of self, spirituality, writing. his, especially. of course I am biased!